Yemen has become a high concern for the United States in its efforts to contain al Qaeda. This is Saana, the capital of Yemen. U.S. law enforcement: "No public evidence of any terrorist action by these individuals"
Washington (CNN) -- As many as three dozen Americans who converted to Islam in prison have traveled to Yemen, "possibly for al Qaeda training," according to a new report prepared by the Senate Foreign Relations Committee. U.S. law enforcement officials told committee staff members "there is no public evidence of any terrorist action by these individuals" but that several have "dropped off the radar for weeks at a time." The report says U.S. officials are "on heightened alert because of the potential threat from extremists carrying American passports and the related challenges involved in detecting and stopping homegrown operatives." 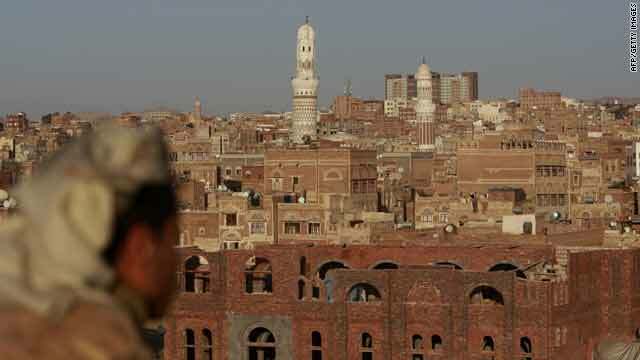 According to the report, the former convicts headed to Yemen ostensibly to study Arabic, but there is concern they could have been radicalized in prison and could be attractive recruits for al Qaeda. The Foreign Relations Committee document says there is also concern about another group of about 10 Americans in Yemen who have converted to a fundamentalist form of Islam and married Yemeni women to remain in the country. One American official referred to these men as "blond-haired, blue eyed-types" fitting a profile of Americans that al Qaeda would like to recruit. In a letter accompanying the report, the committee's chairman, Sen. John Kerry, D-Massachusetts, said, "The group seeks to recruit American citizens to carry out terrorist attacks in the United States. These Americans are not necessarily of Arab or South Asian descent; they include individuals who converted to Islam in prison or elsewhere and were radicalized." Kerry's committee is holding a hearing Wednesday to discuss the threat posed by al Qaeda in Yemen. A U.S. counterterrorism official could not immediately confirm the details of the report. U.S. officials have charged Nigerian Umar Farouk Abdulmutallab with attempting to blow up an American airliner heading into Detroit on Christmas Day. He had traveled in Yemen to study and, according to law enforcement officials, said he obtained his explosives in Yemen.